Executives from the transnational financial institution HSBC contacted British military intelligence to discuss targeting of anti-fracking activists, according to documents released by Anonymous Europe. 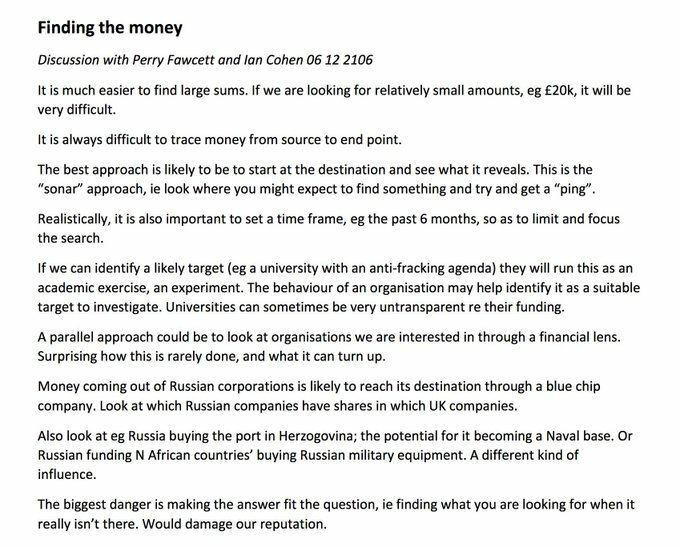 Universities pursuing what Ian Cohen, managing director at HSBC Global Management, described as an "anti-fracking agenda," would be targeted and apparently smeared as recipients of Russian funding. It is unclear whether or not either HSBC or the Integrity Initiative actually believe the debunked and fraudulent claim that anti-fracking organisers are financed by the Kremlin, but it wouldn't be hard to see the multinational bank cynically using the swivel-eyed militarists at II to promote a narrative in line with their financial interests. According to Frack Off, HSBC has poured billions into Canadian tar sands, Cuadrilla, the company drilling for shale gas near Blackpool in Lancashire, and other projects. Just yesterday, the bank faced major protests in Doncaster over its decision to increase its investment in IGAS, which recently started drilling in Mission Springs, endangering owl species and risking major earthquakes. The bank also partnered with Saudi Aramco during the proposed IPO last year. Saudi Arabia declared at Davos its intention to become a "major player" in the US shale gas industry. Another Davos attendant, fascist Brazilian President Jair Bolsonaro, saw a huge influx of HSBC money into his country following his victory on a platform of deforestation in the Amazon. 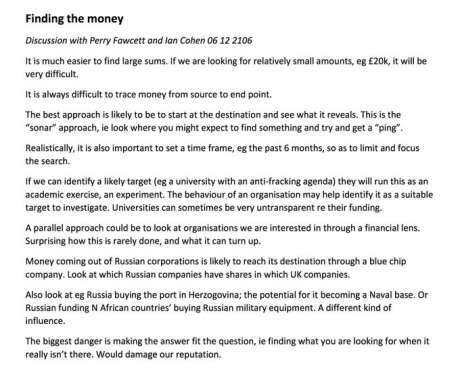 The Integrity Initiative's decision to align itself with "patriotic billionaires" like Ian Cohen of HSBC is based on the organisation's great fears that Russia is trying to undermine "Euro-Atlantic values." NATO's Stratcom division defines "Euro-Atlantic values" as support for free market economics, individualism over collectivism, and belief in NATO, among other dubious worldviews rejected by massive sections of the UK and US public. But these values are widely backed by corporations like HSBC and IGAS. The belief that regulations should be minimised shields them from all accountability when their dirty projects devastate wildlife and localities. The idea that people can band together as groups or collectives is an existential threat to the companies, as fracking is overwhelmingly unpopular and can be resisted effectively by solidarity-minded communities. As for NATO membership, the pumping up of a Russian threat on the border with Ukraine has allowed U.S. gas exporters to claim that fracking gas from across the pond is safer and in the national interest of European states, even though it is far more expensive than Russian gas, and any gas dangerously pollutes the environment, creating a vast security risk to ordinary people far more real than a Russian spectre. Is there any wonder, then, why HSBC would be "patriotic?"